Act 7 dropped us off in Theramore after completing various quests in Stranglethorn. Some of these involve returning to the racetrack in Thousand Needles, so before doing anything in Dustwallow, you should fly to Gadgetzan very briefly to turn in those quests. For starters, during act 6, you should have run out to the Shady Rest Inn and grabbed 3 quests that you turned in around town. If you haven't, you need to go do that some time in the very near future. (Before scene 2, anyway.) You also probably didn't finish The Missing Diplomat, so we'll wrap that up now. Grab all the quests you can find in town. There will be others outside it, but just stick to Theramore itself for now. Oh yeah, and don't forget to set your hearthstone. There are two quest series we will begin without really leaving home. The first is from Calia Hastings -- just talk to 5 Deserter Agitators, defend yourself if you need to, and then go back. The follow-up sends you to the ship at the end of the southern dock. Fight aboard, sneak into the captain's quarters at the stern of the ship, (or is the front the bow?) and grab the papers there. Wait a moment and you will get a third quest to talk to each of the town guards very briefly. Distribute the new leaflets to a few guards and return. There's a fourth quest, but we'll pass on it for the time being. Instead, swim off to the north. There's a lighthouse just outside town. You'll be able to get a new quest there to kill the threshers in the water. Not a tough quest, but water breathing is handy. Take your oil back to Babs, the questgiver, and she'll give you a book to give to a merchant in town. His follow-up will come later. Not bad for not going anywhere! The only quest from town you will need right now is The Deserters. It's part of the Shady Rest Inn quests. 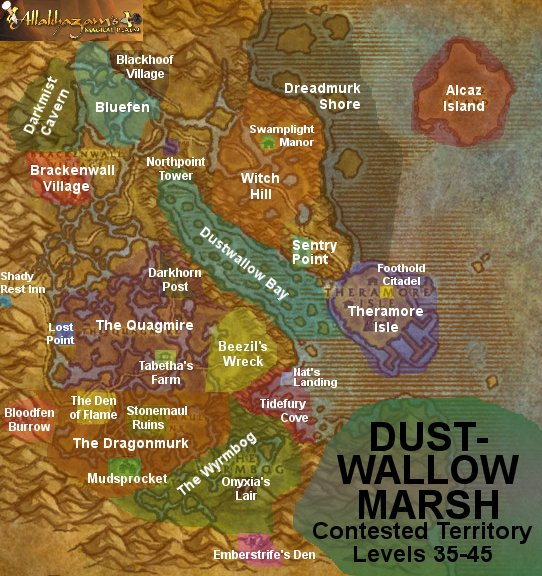 Follow the road out to Sentry Point and grab the quest there, "Defias in Dustwallow?" Further up the road, there will be a house off the right side of the road with two questgivers. Stop here, grab the quests, and start working on them. Focus on What's Haunting Witch Hill? and make sure you get the killing blow on each of the mobs (as opposed to a pet) or the kill won't register for the quest. After slaying 10 undead, return to the manor and get the follow-up to collect 9 small plants that are all around the watery regions of Witch Hill. Grab those, as well as finishing up your frogs legs. Yes, you are indeed supposed to kill critters. With both quests complete, return to the manor for follow-ups once more, and you will get an item to use on the end of the dock right there. This will summon a level 36 gargoyle, which shouldn't pose much trouble for you. At this point, you are going to head way way down the road. There are two reasons for this. One is to grab some quests. The other is to do The Deserters. There are times when I run the guide through a quest that is utterly annoying at the level we're at, *cough Kurzen's Mystery*, but I do have a reason for it. You'll just have to trust me. Recruit some help if you can. In the meanwhile, you should be running up the road toward Northpoint Tower where you will grab Raptor Captor and possibly finish The Missing Diplomat. Hendel's buddies attack you, so be prepared for a tough fight. Beyond that, as the road starts to turn south, continue due west, passing just south of Brackenwall Village looking for Mudcrush Durtfeet. He's Hungry! And then south down the road to Lost Point where the hard part comes. Lost Point is teeming with guys. They patrol, they respawn quickly, and your target is deep inside the tower. It's better to be slow and methodical than to rush, because chances are you'll end up fighting adds anyway, and if you die at the hands of 3 mobs, you'll get crushed by respawn. Pull very carefully, get to Balos Jacken inside, and get the info you need. I apologize again for making you do this. If you have the patience to fight back out, you may as well run the rest of the way down the road and get the flight point in Mudsprocket. I will assume you have this flight point. Just stay on the road, and take both right forks. This will be a productive run. Go to Northpoint Tower and you'll note you now have two new quests to do thanks to your completion of The Deserters. Head north and look for raptors to captor...er, capture. They can be lasso'ed at 20%. While you're heading up toward the entrance to the Grimtotems' area, you will probably see "Stinky" Ignatz on one knee. Help him look for his herb and escape the swamp while you're here. Kill Elders for notes. You need 4. Collect armaments throughout the compound. Grab keys off the Tauren and use them on the cages at the north end of the village. Finish all four of these tasks, and then continue south*WEST*. PvP'ers beware: we are going very near the Horde village. In front of Darkmist Cavern are a whole ton of spiders, and Jarl Needs Eyes. So kill spiders for 20 eyes, they drop 2 on average, and then return to Northpoint Tower and Swamplight Manor to complete quests. Run down the docks as though you were going to take the boat to Menethil. If it isn't raining, you should be able to see another ship off in the distance. Swim out to it, fight your way aboard, and head down into the captain's quarters. Defeat Gavis Greyshield, and head back to town for a decent reward. Leave town along the north shoreline. Kill turtles as you go. When you reach the first noticeable island, swim out to it and look for Garn Mathers. Kill him, and return to Sentry Point to finish Defias in Dustwallow? Go back up the coast again to island #2, killing turtles as you go. Cut straight across the island, clearing the Defias, to Renn McGill. Renn will have to grab two items from the island you just plowed through, so just poke around for two groundspawns. One sometimes appears on the northwest beach. Take both items to him for a brand new (sorta) diving mask! You probably noticed a few floating pieces of wood in the water. Head out to each one of those, dive to the sea floor, and use the Salvage Kit to try to collect from the debris. You will either get a strongbox for the quest, or your very own angry experience-less murloc! At least they have loot, but they don't even drop the quest item for Hungry. Speaking of Hungry!, after you finish your diving, return to the beach and follow it to the first murloc camp you see. Carefully pull murlocs from here or wherever else to get the Mirefin Heads you need. This particular spot is significant because there is also a small path inland that the murloc Razorspine patrols. Jarl wants his sword, so you definitely need to off that guy. Hang out in the area until you have all your turtle tongues and your fishheads, and then take that path due south to Swamplight Manor to finish your business with Mr. Swamp Eye. Return to town to wrap up your complete quests. Fly to Mudsprocket. (Or run there.) Grab the quests that are available, and then go back up the road to the north and take the east fork to Tabetha's Farm. (That would be the second fork. The first goes into the Stonemaul Ruins.) You have two quests to go see Tabetha, and she and her two apprentices have four additional quests. Leave the farm north. You have two things to watch out for -- Mottled crocolisks and spiders. The crocolisks are involved in an annoying quest that I'm going to recommend you just drop. The goal of that quest is to drop the totem in your inventory, bring crocolisks to it, and kill them nearby. The problem with this quest is that the totem is on a two-minute cooldown, making it hard to relocate, and I wasn't always getting credit for defeating the crocolisks near the totem. Not worth beating yourself up over. However, do kill spiders as you come across them. Ultimately, our goal isn't either. There is another Grimtotem compound to the north, and you should have two quests from Tabetha related to them. One is simply to kill 12 Tauren. The other is to head into each tent and burn it with Tabetha's torch. In one of the tents, you will find a Forsaken apothecary, who drops a note to start another quest. Leave the Grimtotems to the northwest. You'll find spiders along the way (and the wrong kind of crocolisk) as you head toward Durtfeet to finish his quest. Get on the road and take it due south until it bends to the east. That's your cue to go off the road to the southwest instead, where Bloodfen Burrow houses a bunch of raptors. The drop rate on feathers is rather poor, which will give you plenty of time to clear around and expunge Goreclaw the Ravenous. When you are finished with those tasks, return to Mudsprocket, and then to Tabetha's Farm to complete the quests you have done, which should be everything you started on except that stupid totem quest. (By the time you read this, Blizzard will probably have fixed the quest.) Out of Tabetha's Farm, we're going to *attempt* to do a couple last things, but you can throw in the towel now if you like. Go east to Beezil's Wreck. Avoid the mobs as best as you can. They're above your level, and unimportant. The goal is to reach Moxie Steelgrill. Talk to her, don't bother grabbing her quests, and go east. Look around for crates you can loot -- if you're lucky, you'll be able to grab Razzeric's Seaforium Booster. But don't kill yourself over it. Instead, jump off the cliffs and into the sea. OK, I said don't kill yourself. Land in the water, and head to Nat's Landing to complete Is It Real? Nat will have a small task for you to do to the west-southwest. Use the paste and hang out in the water around the ship and eventually a shark will appear. The shark takes forever, doesn't always arrive in the 5 minutes the paste lasts, and the only success I've had with spawning it was to swim around inside the shipwreck killing all the makrura. He appeared when I came out. If you bother to complete that, there's a neat -- and very easy -- quest to kill a sea monster that will attack Theramore. All you need to do is constantly go between the three cannons on the docks and right-click them. Eventually Tethyr will die. One of the final things you should have done, in Theramore, was report back to Captain Vimes. He'll want you to take a wreath to the graves of Smiling Jim's wife and son. Report back to him when you are finished. The only other thing worth mentioning that is left to do in Dustwallow is Triage. If your First Aid skill is high enough, Doctor Gustav VanHowsen will be willing to teach you mastery in First Aid. All you need to do is target a bunch of soldiers and right-click on a special bandage roll. OK, it's not that easy, but if you find a badly or critically injured soldier right away and start bandaging him, you can pan the camera around to take stock of the rest of your situation. Get critically pronto, then badly, but don't ignore the merely-injured soldiers either. Keep track of what enters when, and this should go by no problem. You can abandon all your remaining Dustwallow quests. We're done here. Take the boat to Menethil and fly down to Ironforge to begin Act 9. This page last modified 2008-12-14 10:38:15.